The Council for Economic Opportunities in Greater Cleveland (CEOGC) has been an important resource to low-income families in Cuyahoga County for over 52 years. Since we opened our doors, we have been a beacon of hope and a trusted resource for tens of thousands of children and adults. We are proud of our history and excited by our future! 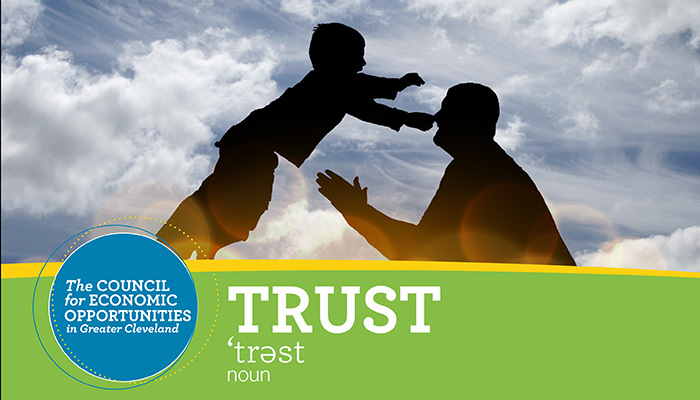 Trust is at the heart of the services we provide. Each day, individuals and children come to one of our 17 locations seeking help to improve their lives; from a parent, who brings their child to Head Start and volunteers in a classroom or on a leadership council, to individuals that enroll in one of our workshops, interact with a counselor, or get emergency assistance for food, clothing or utilities, each depends on our committed staff to be there and to help. Unfortunately, trust can be easily broken when actions are not aligned with expectations – this is as true for organizations as individuals. In order to rebuild trust, an organization must be consistent and transparent: consistent in communication and behavior and transparent in actions. This is our standard and our commitment! We at CEOGC take the community’s trust very seriously – it is the lifeblood of every organization, especially non-profits whose missions are to serve. For over a half-century, our employees have been trusted partners in the lives of our customers, young and old, and we are committed to remaining such as we enter our next 50 years!